Voting separately, CWA members in the New York-New England region (CWA District 1) and the mid-Atlantic (CWA District 2-13) and in New Jersey overwhelmingly ratified four-year contracts. Workers represented by IBEW Locals 827 (mid-Atlantic) and 2213, New York, and T6 in New England also overwhelmingly ratified the contracts. 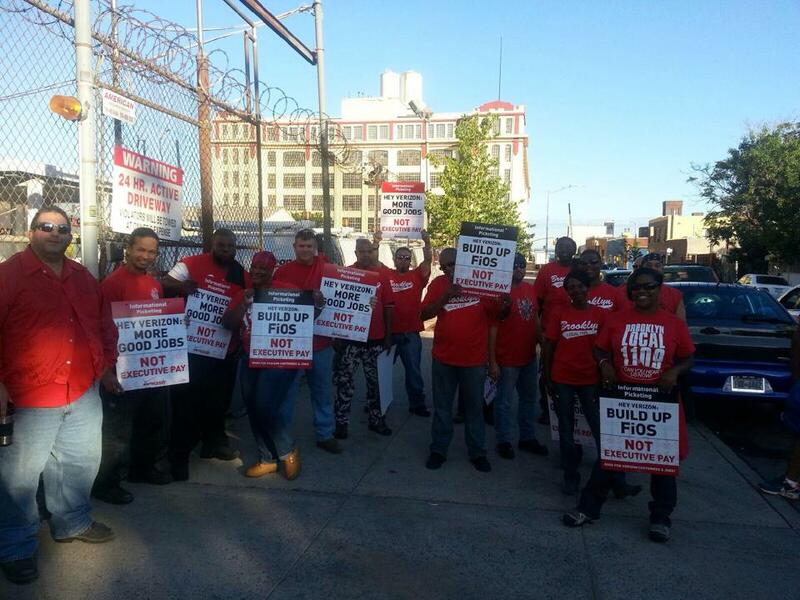 Verizon Wireless technicians ratified a separate agreement by an overwhelming vote. That contract covers about 100 VZW technicians in New York, and contract gains include a 10.9 percent wage increase over the four-year term, a $1,250 signing bonus, new paid parent leave benefits and improvements in stand-by pay. For Verizon Wireless retail store workers in Brooklyn, NY, and Everett, Mass., who overwhelmingly approved a separate contract, the first-ever contract makes major improvements in job security and other areas. The contract provides a first-ever grievance and arbitration procedure, protections against arbitrary discipline and firing, and restrictions on the company’s ability to subcontract work. In a big gain, $2,000 of performance-based pay now will be guaranteed as part of workers’ base pay. The contract also gives workers the right to swap schedules, enabling workers to better balance their work and family lives. Workers at Verizon Connected Solutions also ratified a separate four-year agreement that provides for the same benefit improvements as the core wireline agreement, and in a big gain for workers, maintains a key job title that ensures that these workers will receive wage raises according to the negotiated pay scale. The ratification votes were conducted by local unions between May 31 and June 17th. The local votes were conducted through mass membership meetings, mail-in ballots, or walk-in voting at various polling places in proximity to major work locations. “It was a tough strike, but this contract, which secures good jobs in our communities and preserve workers’ standard of living shows what can happen when we stand together. I am so proud of our members for standing up for themselves, our communities, the customers and their families," said Ed Mooney, Vice President, CWA District 2-13. • A 10.9 percent raise over the next 4 years with compounded interest, including 3% upon ratification, and 2.5% on each anniversary of the contract. • $1250 signing bonus in the mid-Atlantic and a $1000 signing bonus plus $250 HRA in the North East, and a minimum of $700 in Corporate Profit Sharing payments in each of the next four years. • All call centers that had been threatened with closure in the mid-Atlantic region will remain open. Three of the five threatened call centers in upstate New York will also remain open; the six workers affected in the other two centers will be offered jobs locally in the company. • An increased percentage of customer service work will be handled by unionized workers. As a result, Verizon will add 1,300 call center jobs, 850 in the mid-Atlantic and 450 in the Northeast. • Several major contracting initiatives will be reversed, sustaining work for union members in their communities and returning a significant amount of pole maintenance work to the unionized workforce in New York State. There will be a 25% increase in the number of unionized crews doing pole work in New York State. • Existing job security language is preserved, as is existing language on transfer and seniority protections for retirement incentives. All of the company’s proposals on forced interstate transfers of technicians were withdrawn. • There will be three 1% increases in the Defined Benefit pensions over the life of the agreement. • The company agreed to terminate a performance supervisory program (known as QAR) in effect in the five boroughs of New York City that workers found extremely abusive, and both parties will work with an outside consultant to develop a non-punitive program. This was a major issue for NYC-based technicians. • The parties agreed to changes to active and retiree healthcare that generate savings to the company while protecting excellent plan designs for medical care.